Whether we install a one of a kind curtain rod to match your own décor, oor a 16 ft. tree in your living room, one thing is certain, a custom installation will jazz up any room. 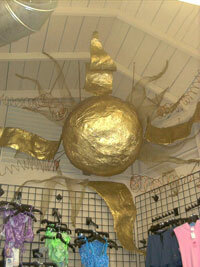 One of our favorite installations was a giant metallic sun, hanging from the ceiling of a tanning salon in Mountain View. What a conversation piece! 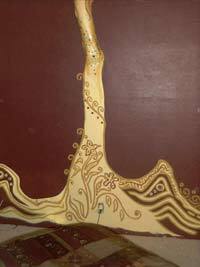 Tree Top - Adorned with jewels that glimmer in the light, as well as hand-beaded ornaments (from India) hanging from the branches, this tree top is both elegant, and functional. Three of the branches have directional lighting on dimmers. 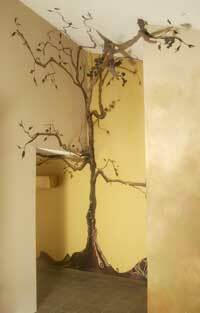 Tree Trunk - This dramatic tree sculpture really does make the most of the space. 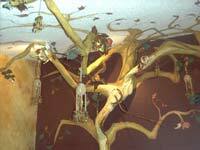 We start the trees with paint on a wall, then the sculpture portion "grows" above head-level. This way we utilize the space of a vaulted ceiling without sacrificing the floor-space. Complete Tree The curtains are made of hand-made fabrics from India, and reach ten feet long, giving the door an elongated, "grand-entrance" feel. 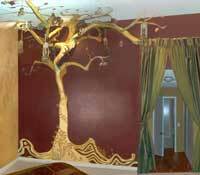 The leaves are hand-painted with gold and copper leaf that tie in the rich colors from the fabrics of the room. The bed which is on the opposite wall has a beautiful canopy which you can view by clicking onto our home decor page. This was such a fun bedroom to design! With instructions from our clients to make their bedroom more romantic, with an international feel, we chose the perfect fabrics hand made on a loom in India. The bed canopy is also equiped with lighting on a dimmer for a "glowing" affect around their bed. 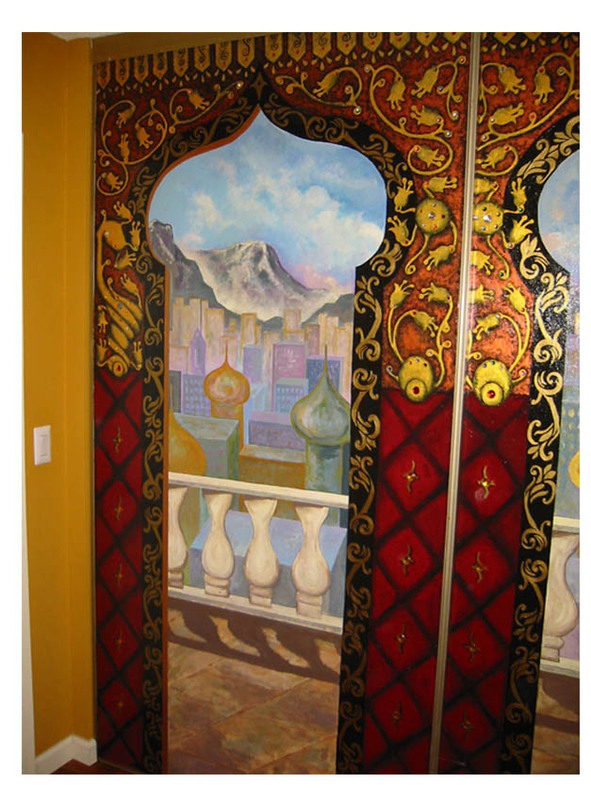 The walls were faux painted with golds, and cream colors to accentuate the look. 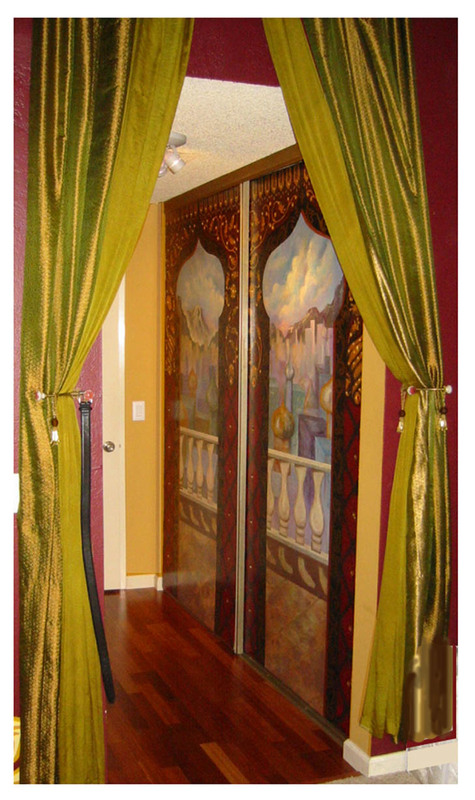 These doors are on a closet in an adjoining bathroom, continuing the theme throughout the bedroom suite. 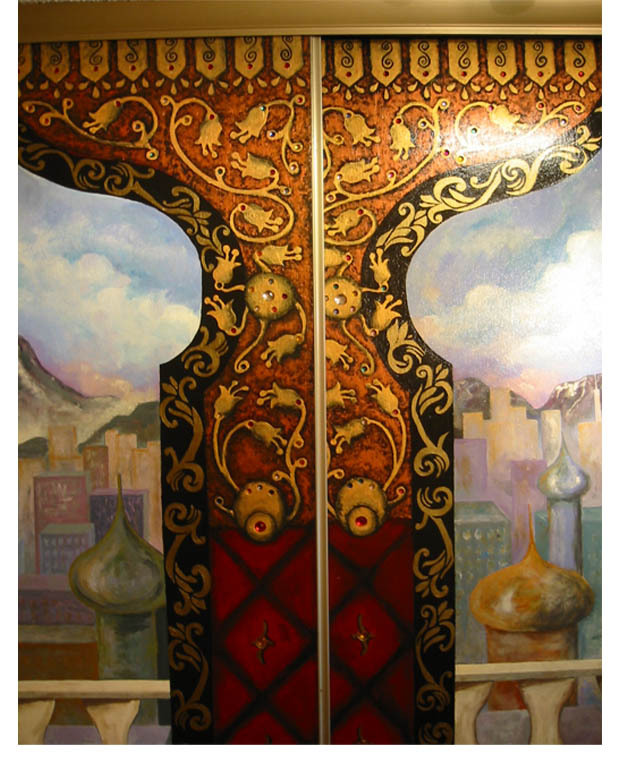 Third view of the doors. 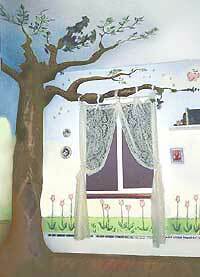 Winnie the Pooh Tree Installation - This tree that doubles as a curtain rod was the finishing touch to a four wall mural in a "Classic Pooh" motif, transforming this little girl's room into the Hundred Acre Wood. Sun Installation: The center of the sun is approx. 4 1/2 feet in diamater. The largest beams reach to about 6 feet in length. It hangs up in the corner of a tanning salon/ fitness store adding a sunny atmosphere. Mixed media.